People were invited to write comments on luggage labels and tie them on a grid. Excellent. A lot of work behind the scenes appreciated. Very interesting exhibition. Well laid out. Good concert on Saturday. Very good project. Lots of good work has been achieved! Very informative. Interesting. Good effort. Exhibition well presented. Informative and interesting. Lots of volunteers to offer any help or answer queries. A very good exhibition well carried out. Keep up the good work Trev Lewis. Just wonderful displays etc. 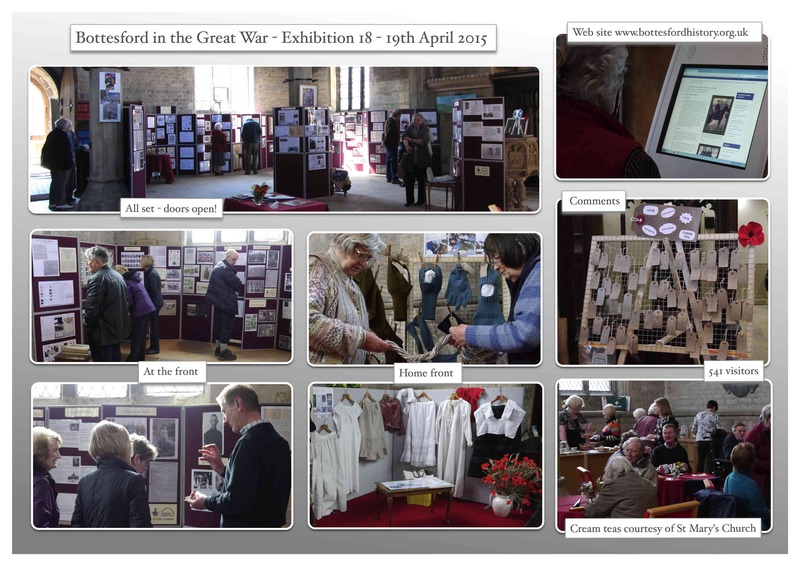 Marvellous information of Bottesford and area and WW1. Really interesting exhibition. Lovely morning spent here. Thank you. A fascinating exhibition, bringing to life what so many went through. Obviously a lot of hard work and dedication. The exhibition has grown so much. Very wide range of information. Well done. Great. Really appreciate all the hard work that’s gone into this. Lovely exhibition, well laid out, unusual exhibits, helpful volunteers in a beautiful setting. Thank you. Such an impressive amount of detail and the personal stories and memorabilia make it a very moving and human story. Fantastic exhibition. Human contribution & sacrifice in any war should not be forgotten. PAX. The exhibition brings the community together. Good to witness. Very good exhibition WW1 “Lest we forget”… A debt we can never repay. A lot of hard work has gone into the knitting. Well done. The WW1 clothing collection brought back memories of my grandfather who wore long shirts in bed! Very practical in the years before central heating. Fantastic knitting. Costume very evocative. All terrific. A moving tribute Very moving reminder of the brave sacrifice made by so many. They did not know what was coming did they. Makes you realise what people gave for us. Makes you realise how lucky we are to live now. Great Performance. Well organised. Brings back memories of grandparents. My Grandfather lost his leg in the Great War when his gun battery exploded. How lucky am I that he was not killed as I would not have been here now. How did the community balance loss of male labour to war with the need to increase food production? An experience to make you think how lucky we are to be here. If it was not for those millions of brave souls where would we be!! Thank you for bringing it back to us. Brilliant. Lots learned by all generations. So much work – a real tribute to those who fought in WW1. This page was added on 28/04/2015.